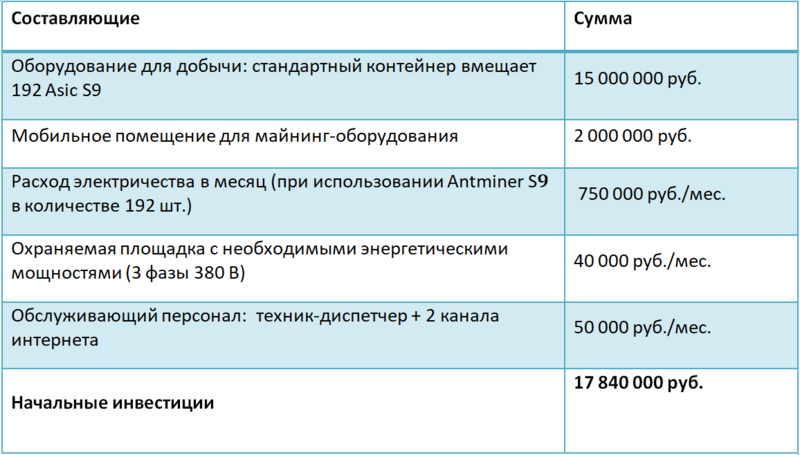 mining transformirovalsya: industrial mining displaces private “home” miners. Replaced unorganized production come big investors who mined the cryptocurrency in an industrial scale. There are companies offering services and equipment to build and equip the farms for industrial mining. 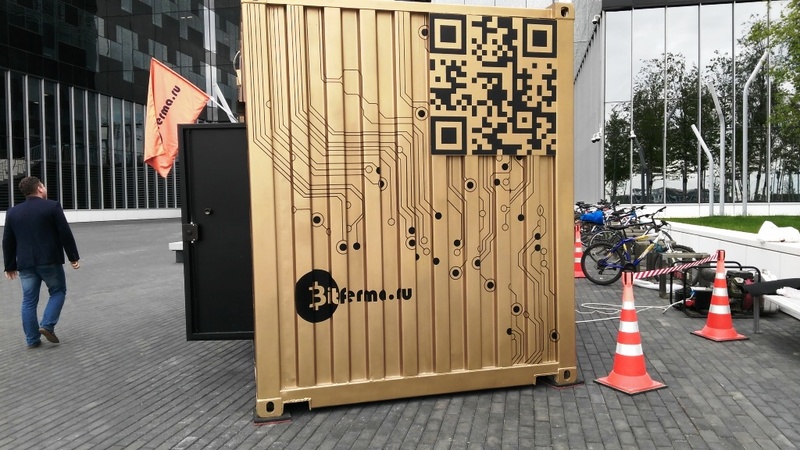 At the exhibition Russian Blockchain Week, innovation in the heart of Russia-SKOLKOVO, we met with the commercial Director Bitferma Vladimir Simakov. Bitcryptonews found out the profitability of industrial mining, investments for the launch, maintenance and payback period of the business project. — The industrial mining of interest to investors why a shift of trend, with private mining towards industrial? — our customers — it's those miners who are willing to go to industrial volume, they understand that is not to mine in the garage, they are willing to invest more. It is also miners that are joining forces with other investors. Cell complex is suitable for miners, which have fixed premises and are ready to move equipment to optimize the costs, find a cheaper site. You never know — the situation has changed in Russia, picked up and moved containers, for example, in Belarus. Also the owners of sites with spare capacity, they buy our farms and attract miners, creating a mining accommodation. For mining-hotels this is the best solution. Already there mining-town, which unites dozens of containers. — With some investments you need to enter the market of industrial mining? Investing can be divided into the following components: the equipment for mining, the hardware-software complex, Playground for the container. table 1. Investment and monthly costs of industrial mining. In the calculations provided data on the average 23.05.2018: market value of equipment — 80 000.; consumption — S9 per month, the cost of consumption 1 kW/h-3.5 rubles. ; the rent of commercial land or industrial area based on the data of Cyan.ru. — what is the advantage of mobile solutions for industrial mining? — Based on his three years of experience, we have created a solution for the efficient operation of the equipment from the point of view of convenience, security and the greatest reward. Equipped containers — is a mobile solution for mining. In a stationary room is a dependence on the lessee in electricity tariffs, as electricity — the main component of operating costs in this business. Always want such a situation to optimize. The container can be transferred to another site in one day. The farm is fully Autonomous and does not require constant presence of staff. Control all the processes remotely. Cooling industrial ventilation, air passes through the filtration system. Mounted in the container surveillance system and fire alarm. The standard package included software for remote control of the bot via Telegram, commissioning. It turns out a high security solution with minimal operational costs. — How to increase production efficiency and equipment service life compared to standard rooms? — the average efficiency and equipment life increased by 20%. Maintaining optimal temperature for recovery of the air in the winter, the system of protection against surges. In combination with previously listed, this creates optimum conditions for equipment operation. — equipment Prices for mining fell by about five times compared to December 2017, how will this affect the field? Mine bigger? — Now the entrance to the industrial, mining more favourable: low cost equipment, especially equipment sales are transparent, the official. There is a shift to a more serious segment. — mostly the production is focused on CIS? Interesting your developing Western or Eastern market? — as of today there are about 300 containers, the geography — Northern Kazakhstan, almost all territory of Russia, Georgia. Mostly the production is focused on CIS. There is interest from Belgium, Canada, the Baltic States, Germany, Britain but not everywhere optimal prices. — do you Plan to release on the ICO? What does the ICO as a whole? — We do not work in this area and basically do not want to smear the reputation. We — sector real business and the real economy. — plans for the future — creating a service cloud of mining, the Union of miners to own pool? — we Have all the conditions for scaling, we develop, we Polish the product, getting feedback from customers. There are new ideas that have not yet want to announce, of course, in the field of industrial mining. — the Council of entrepreneurs decided to start business in the field of industrial mining. — Certainly, the element of risk is high enough, the business depends on the exchange rate of cryptocurrencies, but from a legal business mining — one of the most profitable. And launch of business quick — from two weeks to one month. We believe in the future of bitcoin and the further development of the mining of cryptocurrencies.